We’ve had very little rain this year, so it’s not been a good year to see wildflowers in central Texas. But while it’s been a bad year for the flowers, I still love to get out around Fredericksburg and Stonewall in particular and cycle the [mostly] quiet roads. This is the first year I’ve done the LBJ 100 ride, but I’ve ridden all the roads of their routes. That one was a couple weekends ago. This past weekend was back to the same area and some of the same roads on the Pedal Power Wildflower Ride. The Pedal Power ride includes the Willow City loop route. It’s always one of my favorites. 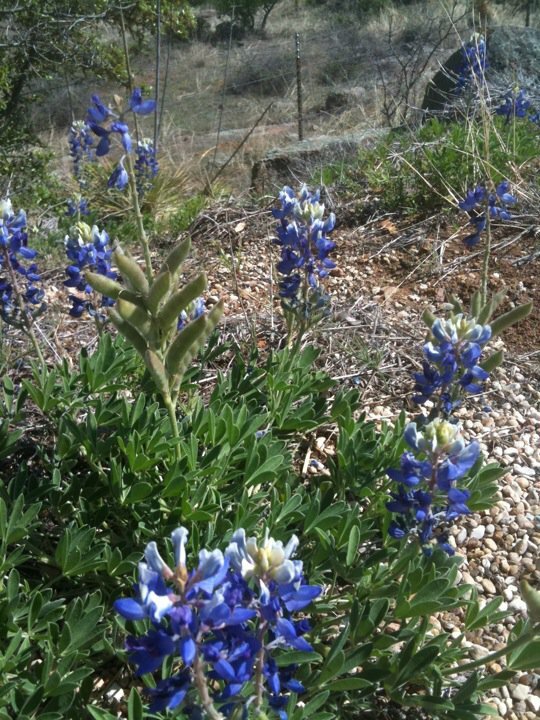 The picture here in the corner of Bluebonnets was one of the few along the way. Very few to speak of this year. Contrast that picture with last year. What a difference some rain makes. We had good weather for both rides this year. Chilly starts but it warmed up quickly. Thankfully only light breezes. It has been almost perpetually windy this spring so to have a couple mornings when it wasn’t routinely gusting to 20mph was a blessing. 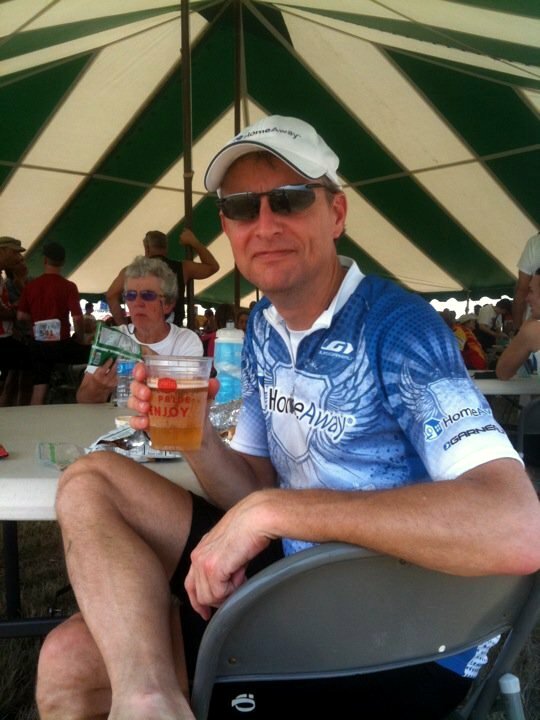 The 2nd picture here is of me having a beer after the LBJ 100 ride. It was close to 90 that day by the time we finished so the brewsky was welcome. You wouldn’t know it by looking but this tent/table was set up smack dab in the middle of the tarmac of the airfield on the LBJ ranch. It’s kinda weird. There’s a huge landing strip out in the middle of a field of cattle where LBJ used to land the Air Force One of the day. On the day of the ride, the landing strip was used as a parking lot and road. It felt odd driving down the runway where LBJ used to land his plane. LBJ’s daughter Luci was there to lead the ride out. Not surprisingly perhaps, there was a fair amount of speechify’ing at the start of the ride. Someone even sang the national anthem. Mostly people just wanted to get on their bikes and ride. 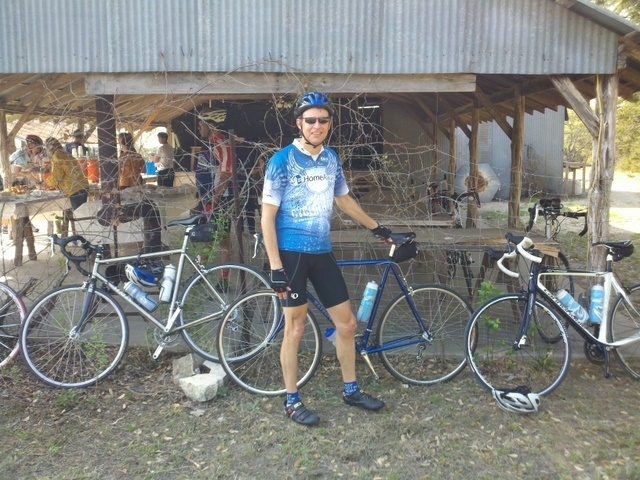 The picture below was taken by Tony at one of the rest stops along the LBJ ride.